This is it. The FCC plans to kill net neutrality this Thursday. Hi, here’s a quick and awesome thing you can do to help sound the alarm about net neutrality during these final hours before the FCC vote. Doing this gets around Facebook’s algorithm and *really* gets the attention of your friends and family. Then you can edit the “story” to add a link to BattleForTheNet.com where they can learn more and take action. We’re already seeing this idea start to go viral. 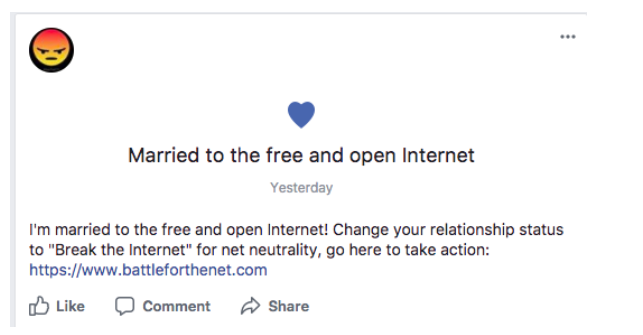 It’s amazing because it generates lots of comments and then engages people in real discussions about why net neutrality is so important to so many people. If enough of us do this, we can reach millions of people who haven’t taken action on net neutrality yet, and flood Congress with calls from constituents at this key moment. Will you do it? Get step by step instructions here! If you’re not on Facebook, there are tons of other ways to get involved. This is a watershed moment. What we do (or don’t do) between now and the vote could determine the fate of the Internet. We’re planning a mass online protest called “Break the Internet” starting tomorrow. Will you join? If enough of us participate, we can spark a political crisis for Congress and force them to step in and stop the FCC vote or overturn it. There’s no time for petitions now. The entire Internet needs to come together and get creative to create the kind of moment we need to stop the FCC from handing Comcast and Verizon the power to control what we can do online with censorship, throttling, and new fees. We’ve got a plan that EVERYONE can use to sound the alarm and drive a flood of net neutrality action to Congress before the vote. Click here to learn more. Add a new “job” on LinkedIn: “Defending Net Neutrality at BattleForTheNet.com” and make sure you’ve got the “notify people when my profile changes” setting on. Change your Twitter and Instagram featured website to BattleForTheNet.com and post frequently using the content. Look. This is bad. We’ve been trying to block the FCC from taking this vote all year and they’re going ahead now hoping we’re distracted by the holiday season. But it’s not over yet. The internet has won these battles before. It’s possible we can do it again. But it’s going to take all of us working together, each one of us deciding that we can make the difference. And people across the internet are getting to work. Thousands have gathered in their local communities to call on Congress to help #StoptheFCC. Even our very own Policy Director Raman Jit Singh Chima from India and Advocacy Director Melody Patry from the U.K. joined protests in Washington D.C.
Get everything you need to “Break the Internet” for the 48 hours before the FCC vote here. On Thursday morning, the U.S. Federal Communications Commission (FCC) will vote to repeal Net Neutrality rules that protect our free and open internet. Without them, internet service providers will be free to control what we see and do online by prioritizing some websites or content while slowing others down, or even blocking them. They will make the internet a pay-to-play world, where those who can’t afford to buy better access won’t reach their audience. Call your members of Congress. FCC Chairman Ajit Pai refuses to listen to those who depend on a neutral, open internet to work, create, learn, and play. But Congress can pressure him to do the right thing. Use this tool to contact your representatives and ask them to help you protect Net Neutrality. We’re going to be emailing a bit more often than normal this week, but that’s because these are not normal times. We’re working round the clock, and regardless of what happens on Thursday we’ll keep you updated about the next steps.